It feels forever since I sat before this screen and said, "Hello You." I miss you. But, it's a quick post this morning as I bend over the keys in my bathrobe, hair still wet, teeth to be brushed, lunch to be made before I skedaddle out the door to the Babylon Tower. Much to come, so much to regale. Link Fest. Crush Update. Quasi Life Lessons even. And this too. You know I love The Veils. Here, here, here and here. There was a letter once written in preparation for the hardest letter I will ever have to write. Do I? Should I? Is it even worth it? 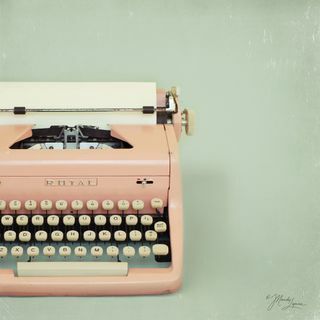 *Also, don't you just adore oldie typewriters? I do!